Thinking back as I type this blog, I think I can remember the first time I ever tried this recipe. I was probably 11 or 12 and it was the first time I made something my mother never had. Dijon chicken breast nowadays doesn’t seem too edgy, but back then I thought it was genius. The original recipe is from a little cookbook I was given by my paternal grandmother. It was a little collection of recipes from other members of her tour group. Its perfect for the night you come home and have chicken in the fridge, but no idea what to do with it. I’ve made a few adjustments to the recipe, and below is my own version of the original. 1. After you’ve pounded the chicken, season with S&P and dredge in flour. 2. 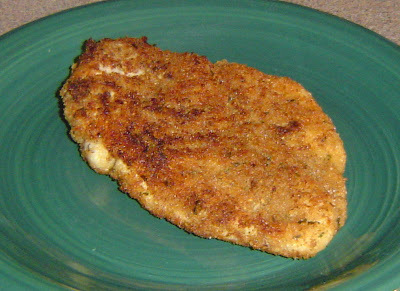 Spread 1 tablespoon of Dijon on one side of the breast, then coat with bread crumbs. Repeat this process on the other side and the remainder of the chicken. 3. Lightly coat the bottom of a large frying pan with EVOO. Allow pan to come to medium high heat. 4. Pan fry each side of breast till golden brown. About 1-2 minutes per side. 5. Finish chicken in a 400 degree oven for about 10-12 minutes or until cooked through. Thoughts: I love how the bread crumbs and Dijon mustard create a tangy little crust on the chicken. The chicken was cooked perfectly and came out nice and juicy.